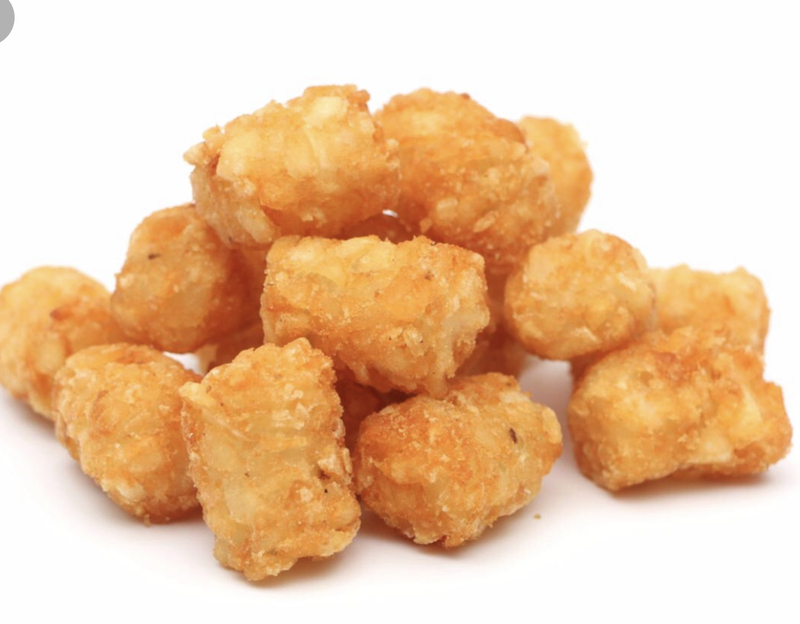 A molded tower of crispy tater tots mixed with melted cheddar cheese, real bacon bits and caramelized onions. 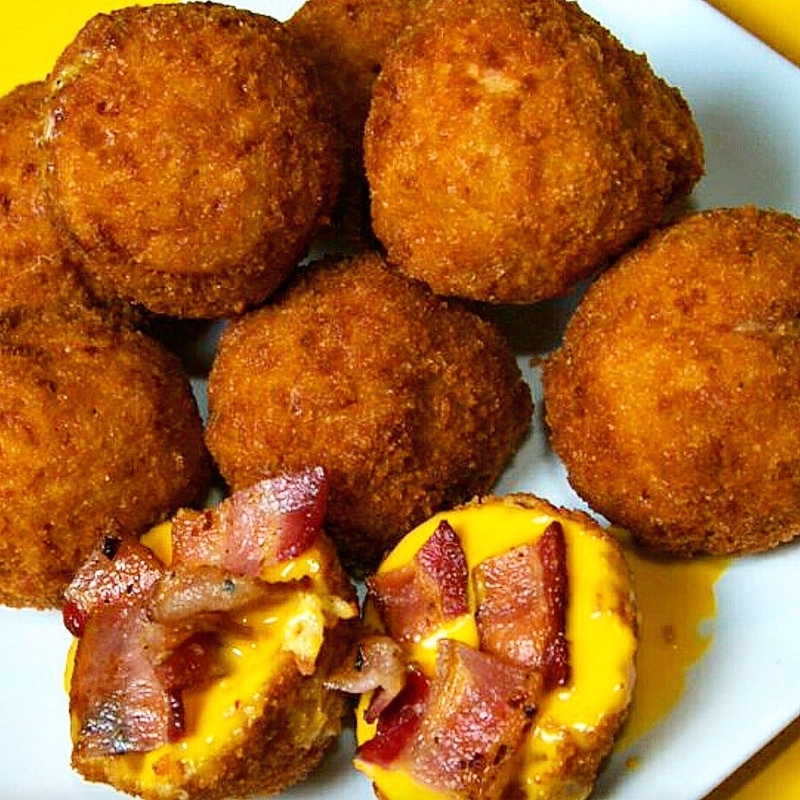 Three types of cheeses melted with elbow pasta, molded into a ball, rolled in our uniquely seasoned breadcrumb and deep fried. 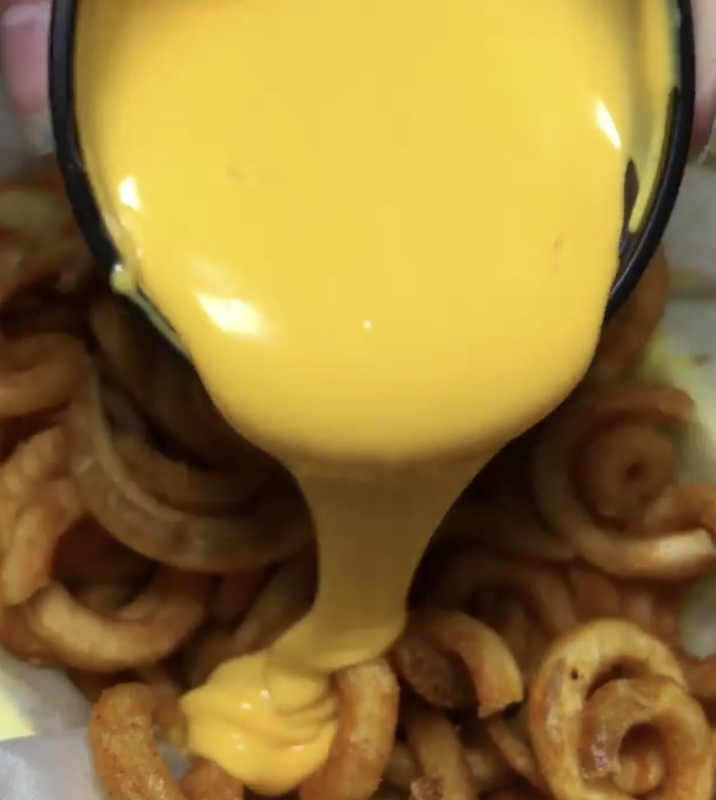 Crisp on the outside and super cheesy on the inside! Our rendition of the classic wing with a smokey, spicy kick! Served with bleu cheese dressing and celery sticks. 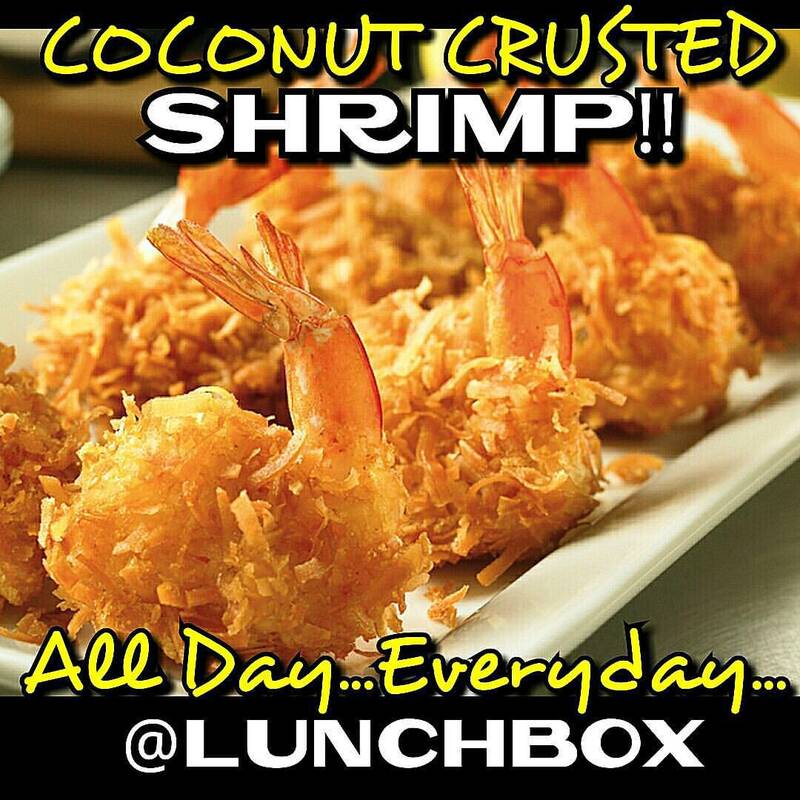 Large butterflied shrimp crusted with shredded coconut breadcrumb. 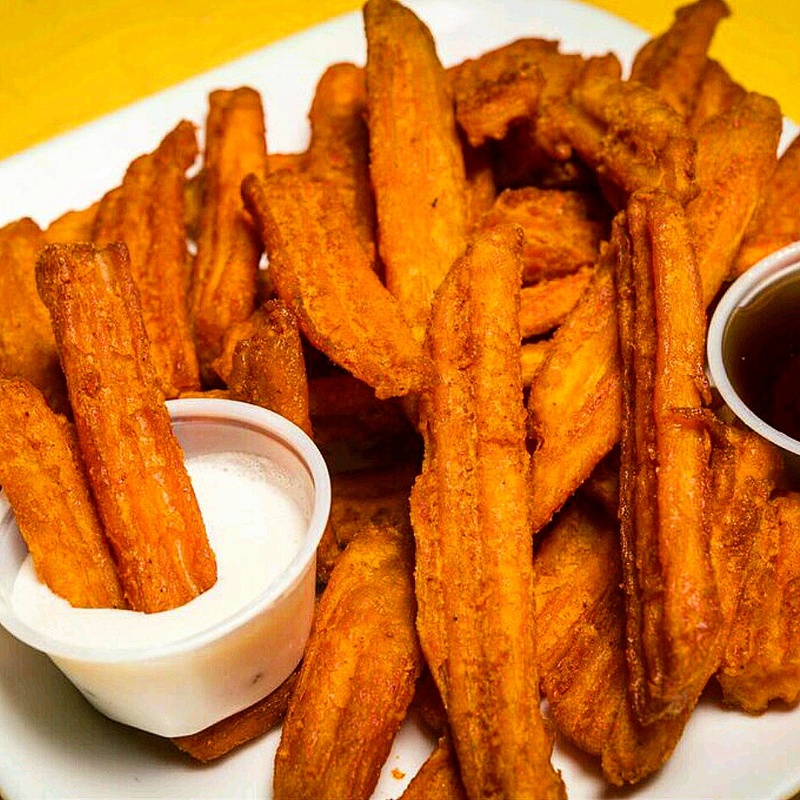 Served with our homemade sweet and tangy sauce. 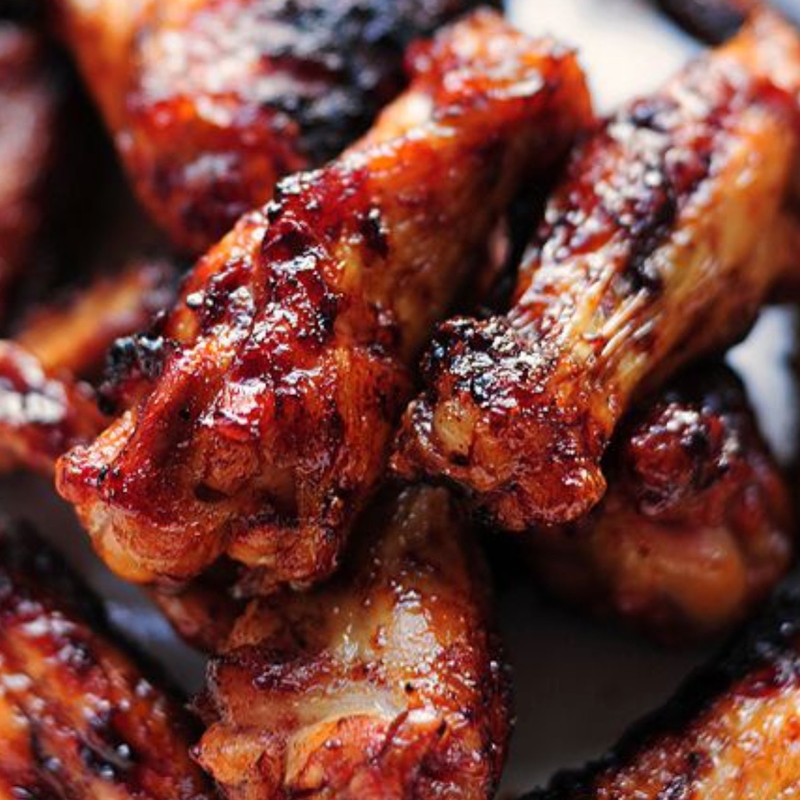 Teriyaki style wings served sweet and savory. No side sauce needed. 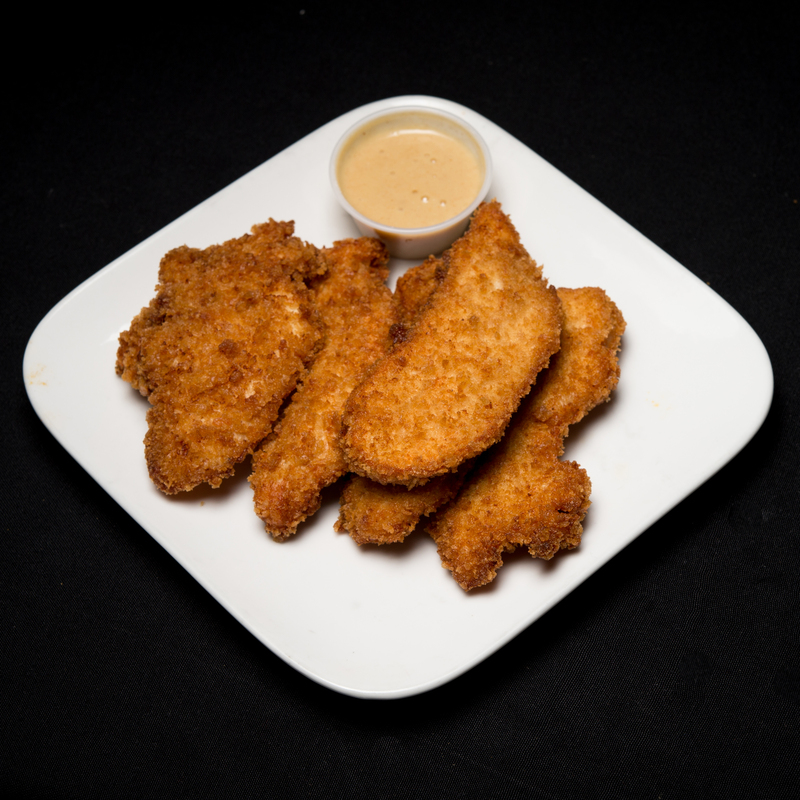 Seasoned and breaded chicken tenders served crispy with homemade honey mustard dressing. 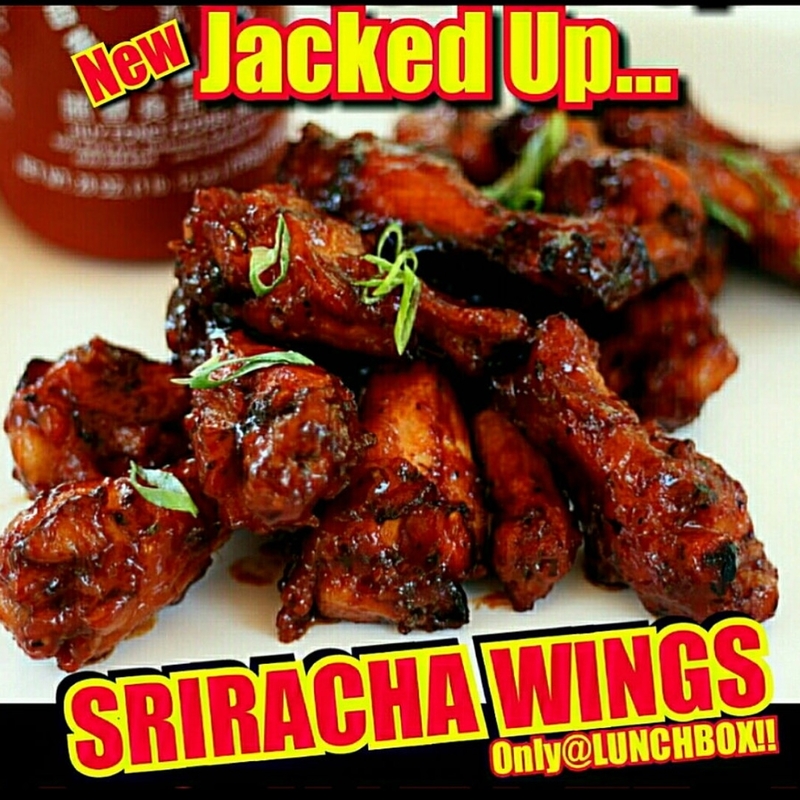 Lunchbox's secret recipe wing sauce. 50% sweet and 50% spicy. 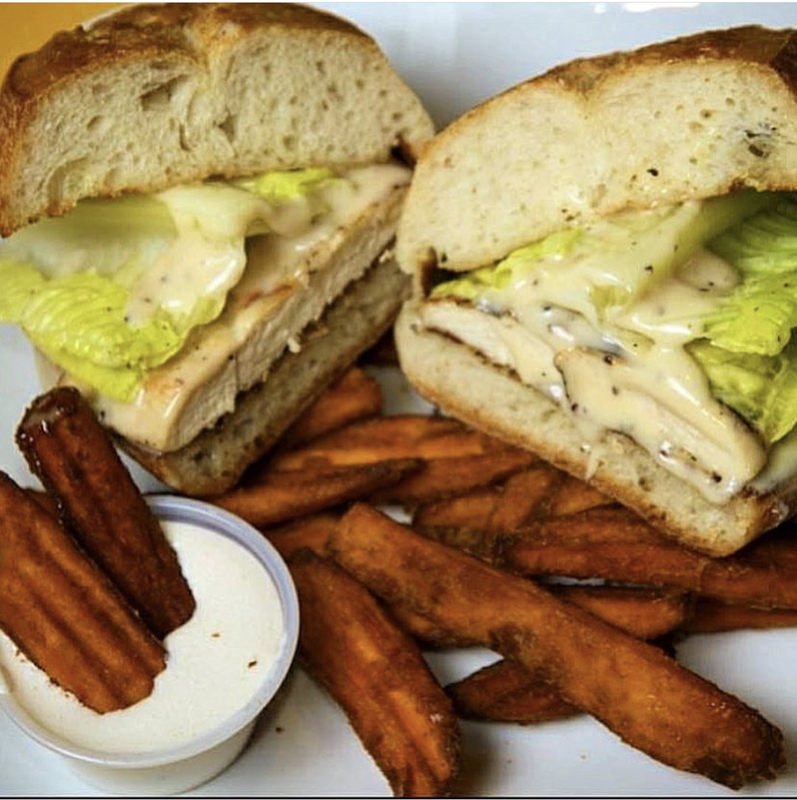 Grilled marinated chicken on toasted garlic bread sprinkled with Parmesan cheese, romaine lettuce and topped with our creamy Caesar dressing. 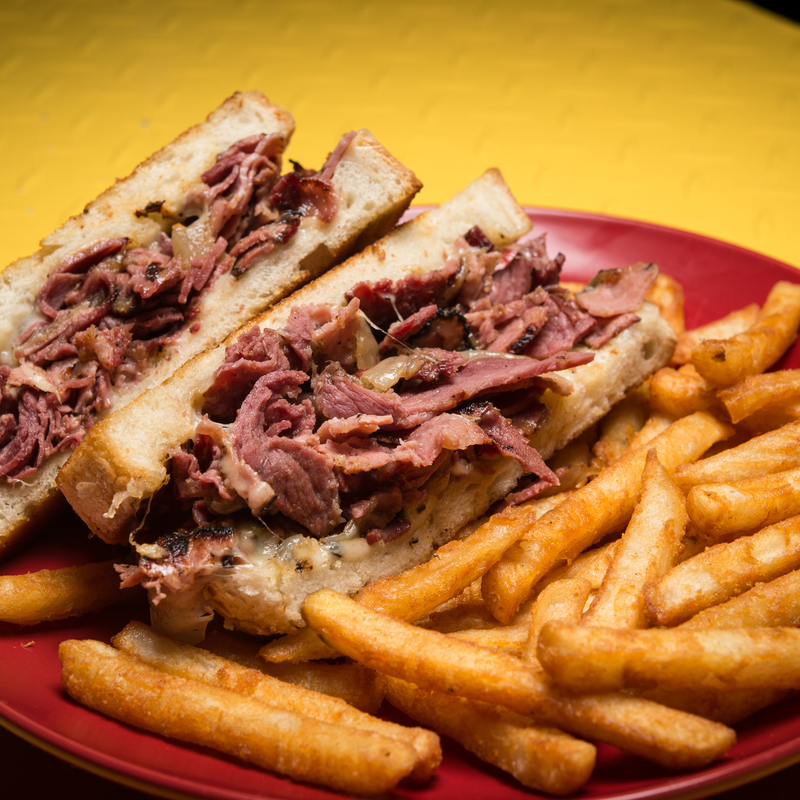 Fresh grilled corned beef and pastrami brisket topped with caramelized onions, smothered with melted Swiss and our special blend of creamy mayonnaise and spicy mustard. 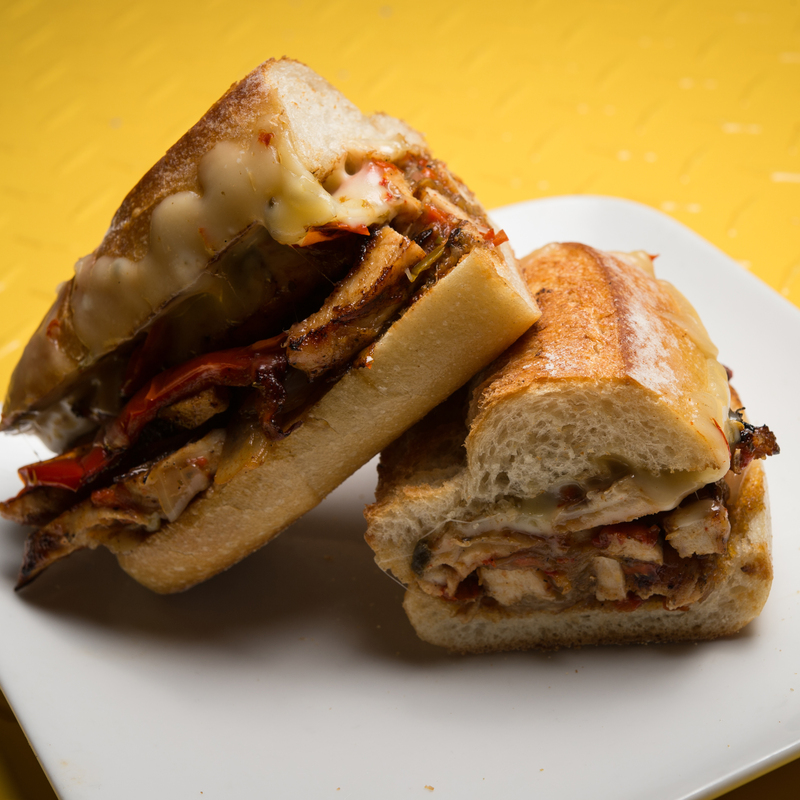 Sliced Cajun grilled chicken mixed with sauteed red peppers and onions smothered with Monterrey pepper jack cheese. 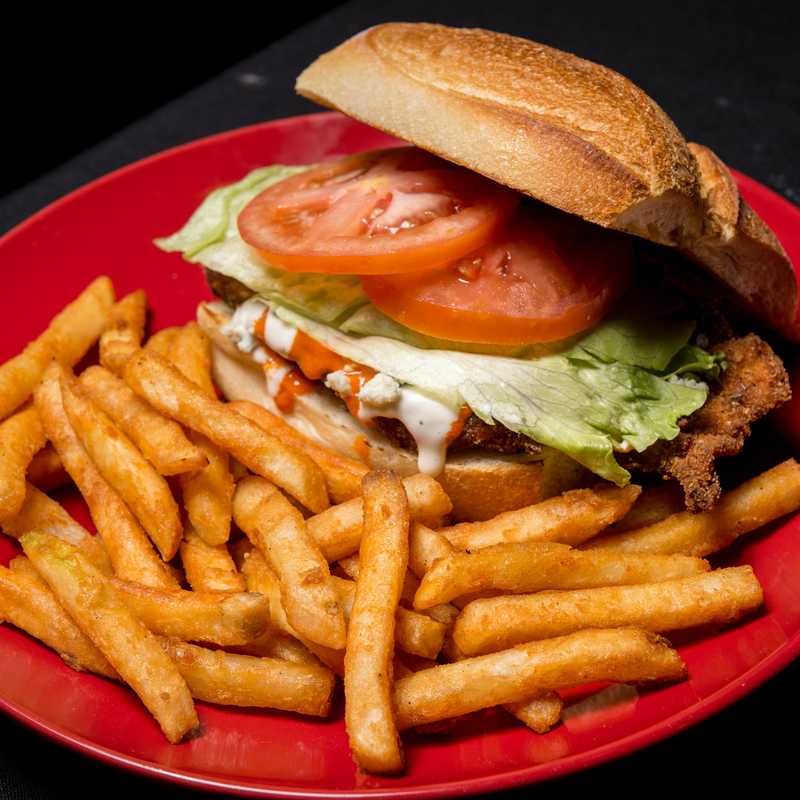 Breaded chicken cutlet covered in spicy buffalo wing sauce topped with crumbled bleu cheese chunks and whole leaf iceberg lettuce, fresh sliced tomato and creamy bleu cheese dressing. 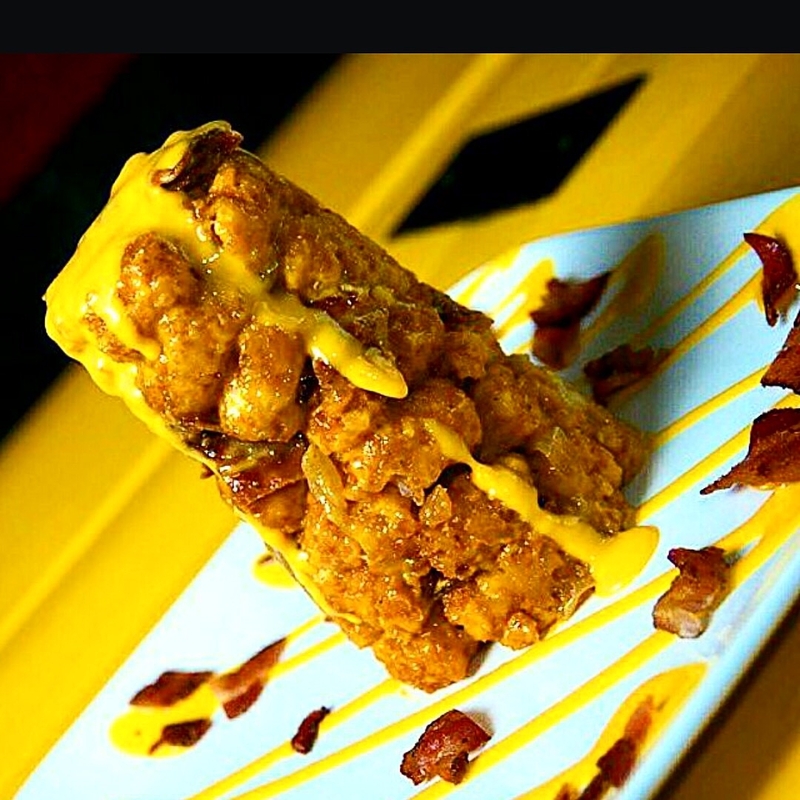 Breaded chicken cutlet topped with crispy bacon, drizzled with barbecue sauce and smothered with melted mozzarella cheese. 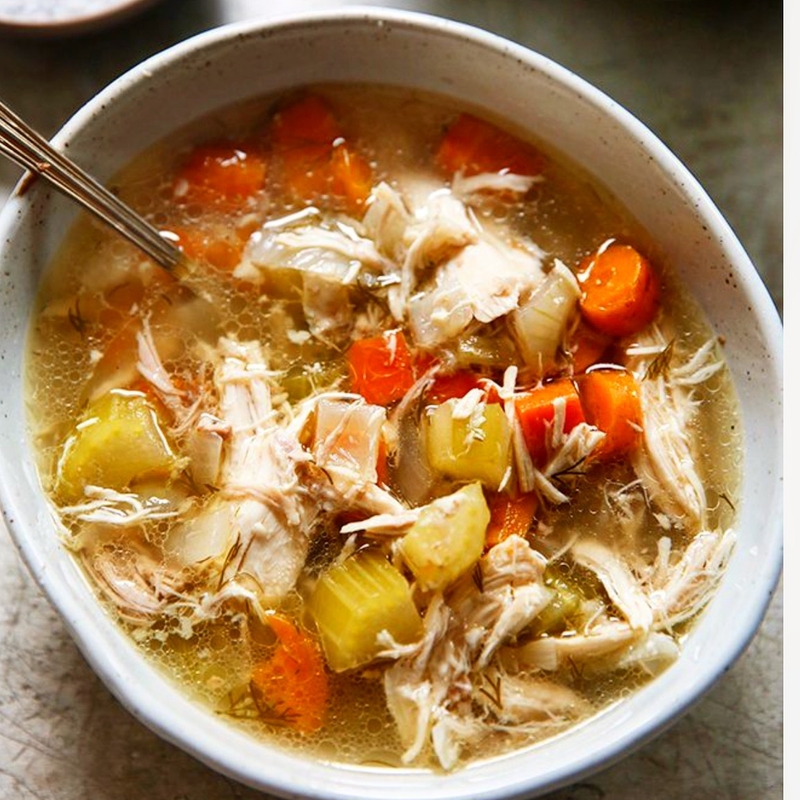 Our hearty home-style chicken noodle soup. Served with extra chicken and elbow pasta. Lightly seasoned and served crunchy. Spanish, white and vidalia onions marinated into our house broth. Served with a toasted biscuit topped with melted mozzarella cheese. Thick-cut, lightly seasoned sweet potato served with marshmallow fluff and maple syrup. 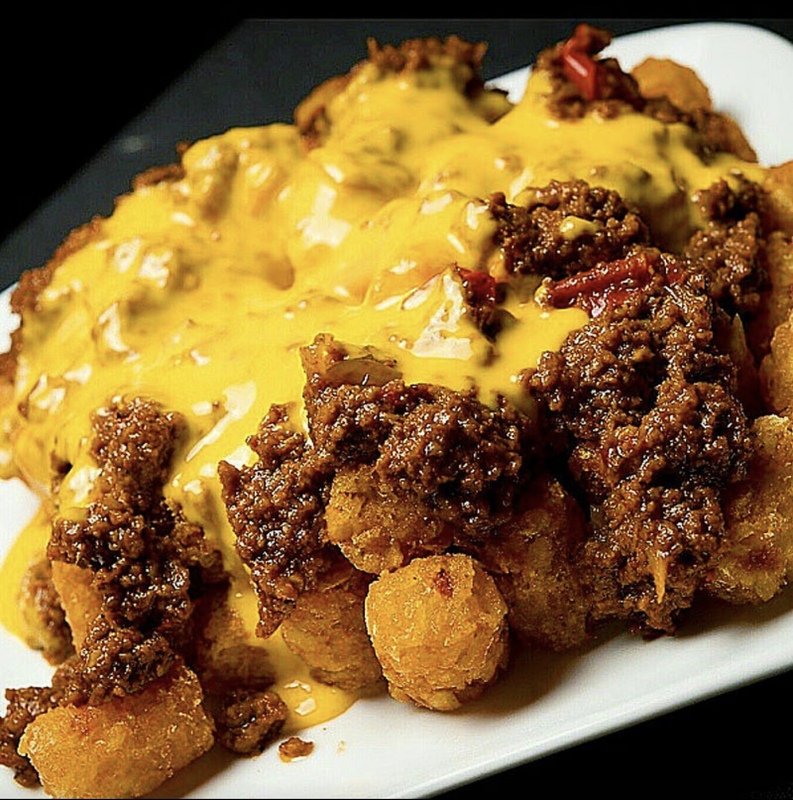 Crispy straight cut fries, curly fries or tater tots topped with our famous Mojo (our version of sloppy Joe) smothered in cheddar cheese sauce. 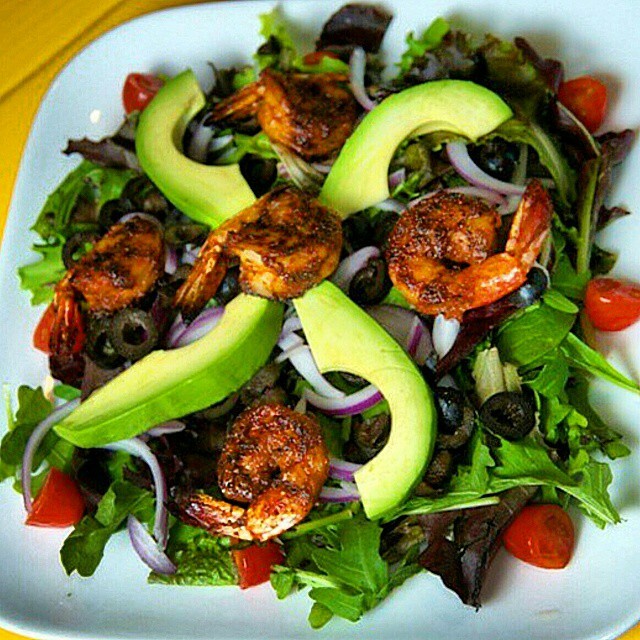 Grilled Cajun shrimp over a bed of mixed greens, with sliced grape tomatoes, Bermuda red onion, avocado and black olives. 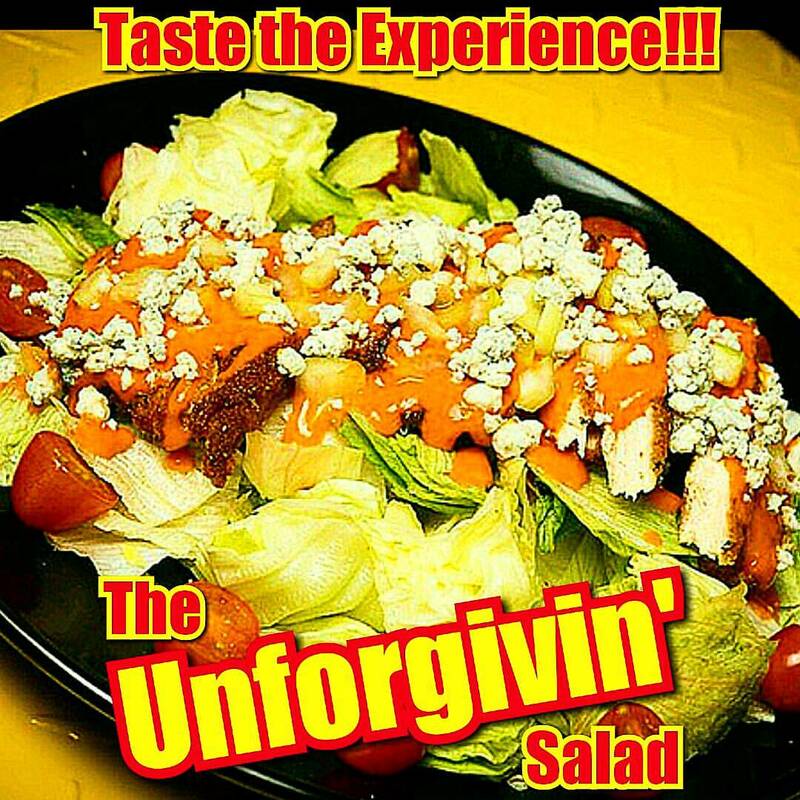 Served with our creamy chipotle dressing. Grilled chicken over a bed of romaine lettuce. 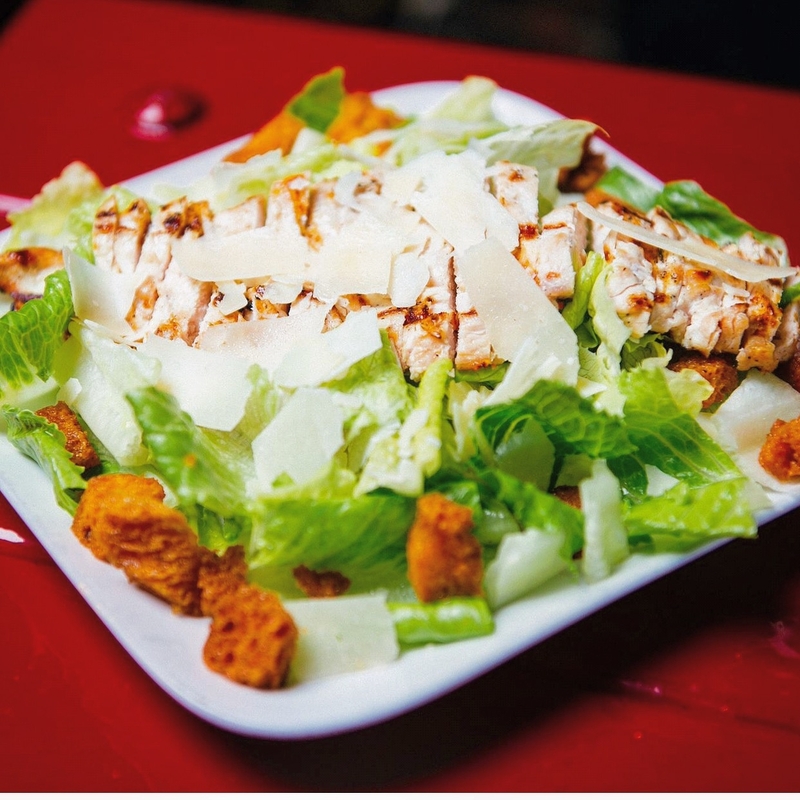 Sprinkled with Parmesan cheese, homemade croutons and served with our creamy Caesar dressing. Sliced breaded chicken cutlet drizzled with our barbecue sauce, topped with real bacon bits and sharp shredded cheddar cheese over iceberg lettuce and grape tomatoes. 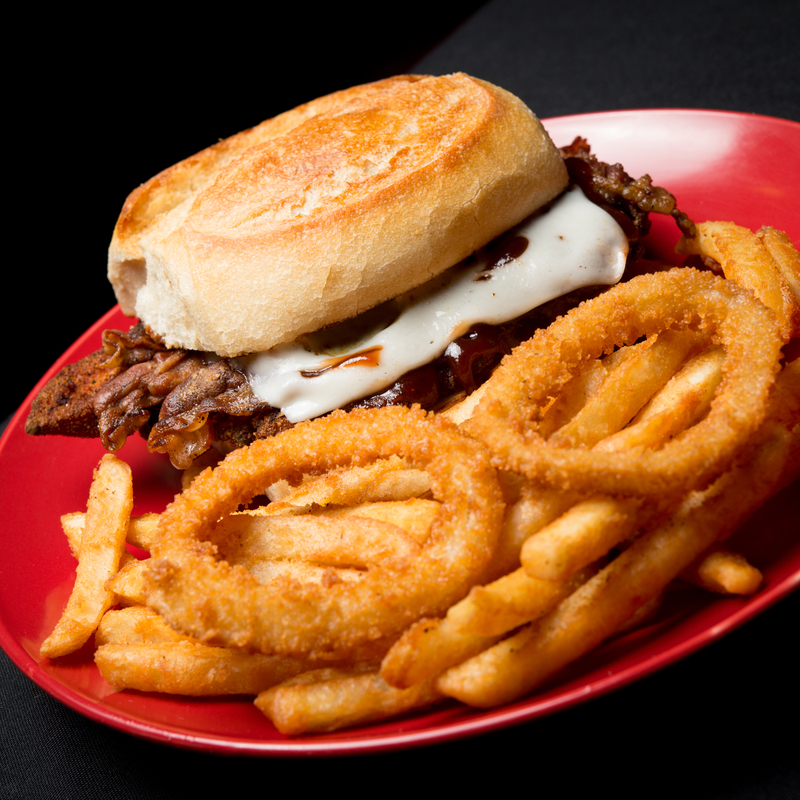 Served with our creamy ranch dressing. 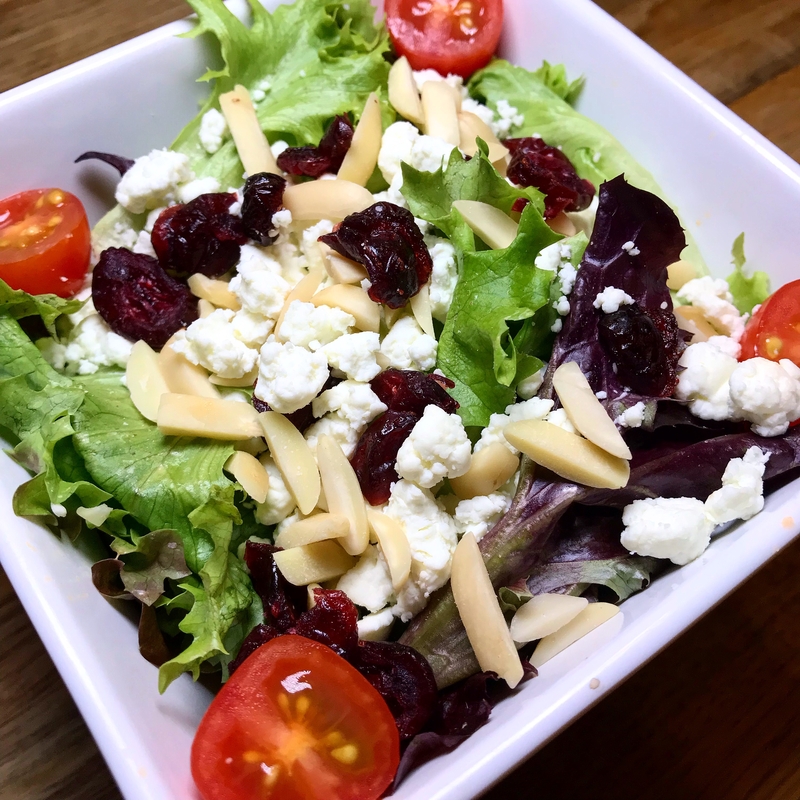 Fresh mixed greens, dried cranberries, sliced toasted almonds, crumbled goat cheese and grape tomatoes. Served with our honey-lemon vinaigrette. 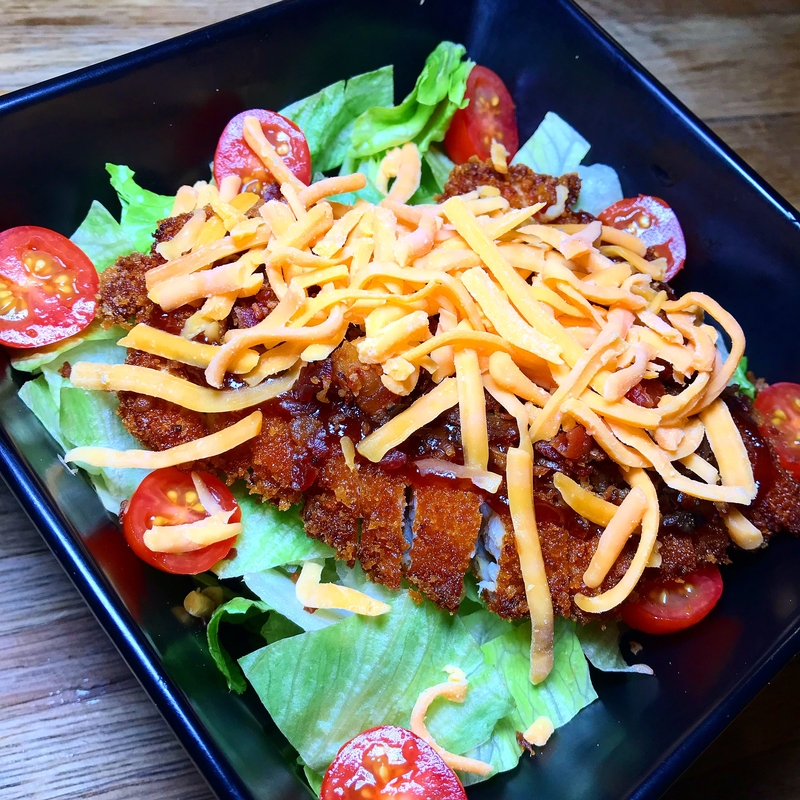 Iceberg lettuce topped with breaded chicken cutlet and drizzled with our spicy buffalo wing sauce, topped with crumbled bleu cheese, chopped celery, grape tomatoes and served with creamy bleu cheese dressing. Our version of fish and chips. "Catch of The Day" breaded in uniquely seasoned crumbs, served with extra crispy straight cut fries and our homemade tartar sauce. 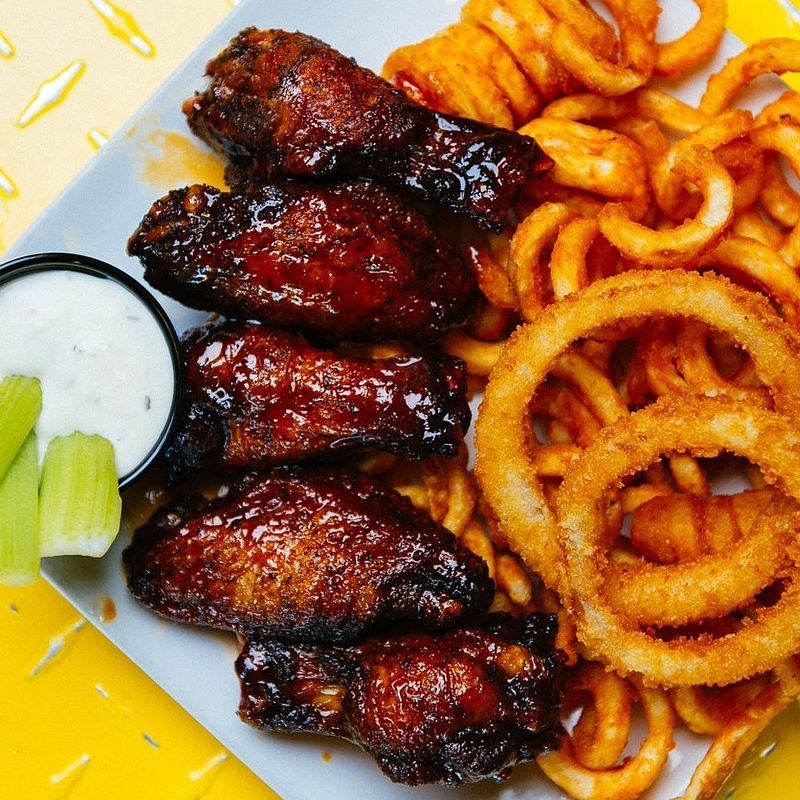 Your choice of chipotle style or Shanghai style wings served with curly fries, bleu cheese dressing and celery sticks. 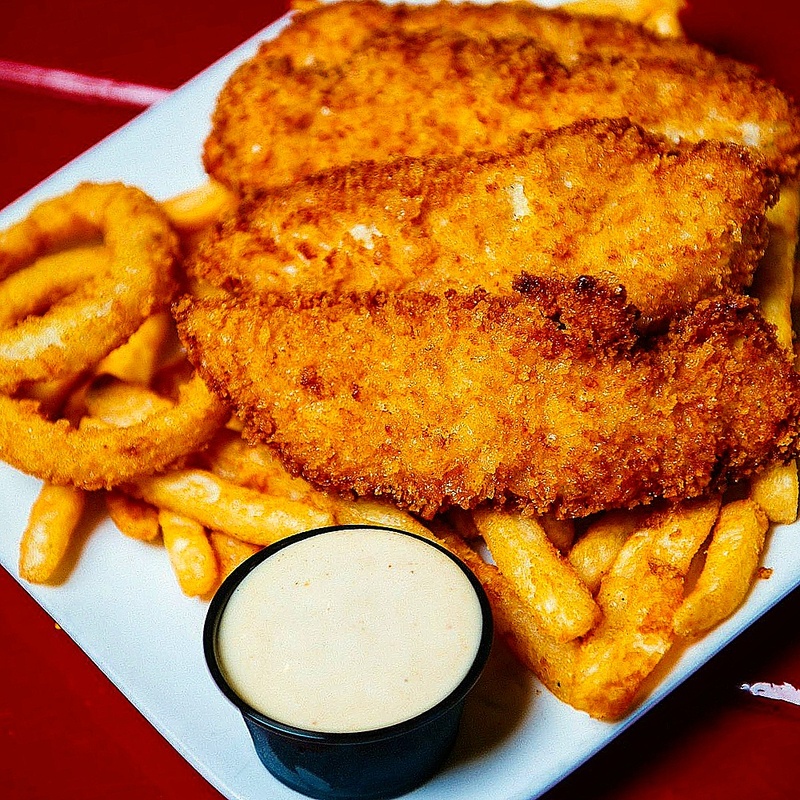 Juicy panko crusted chicken tenders alongside extra crispy straight cut fries. Served with homemade honey mustard sauce. 1/2 lb. burger grilled to order. 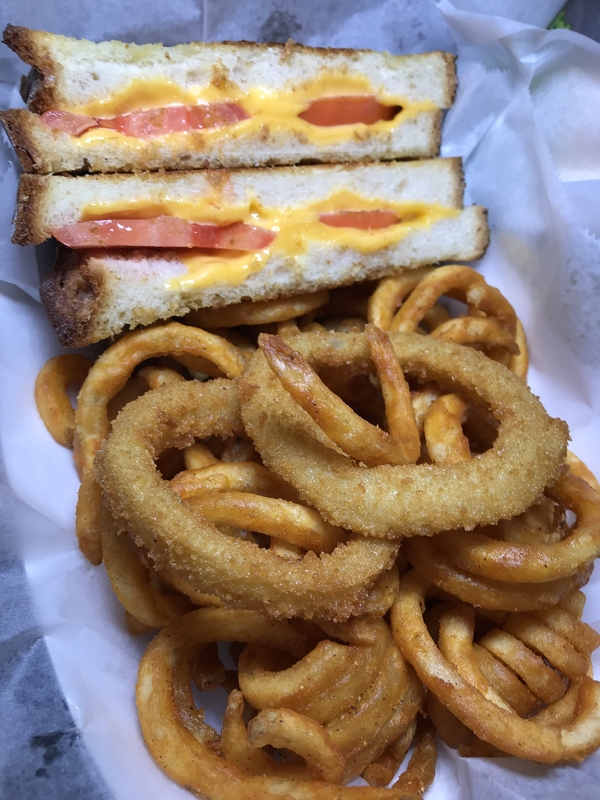 Served classically on brick oven bread or potato roll with lettuce, tomato, American cheese served with curly fries and a few onion rings. Grilled cheese panini with tomato and American cheese. 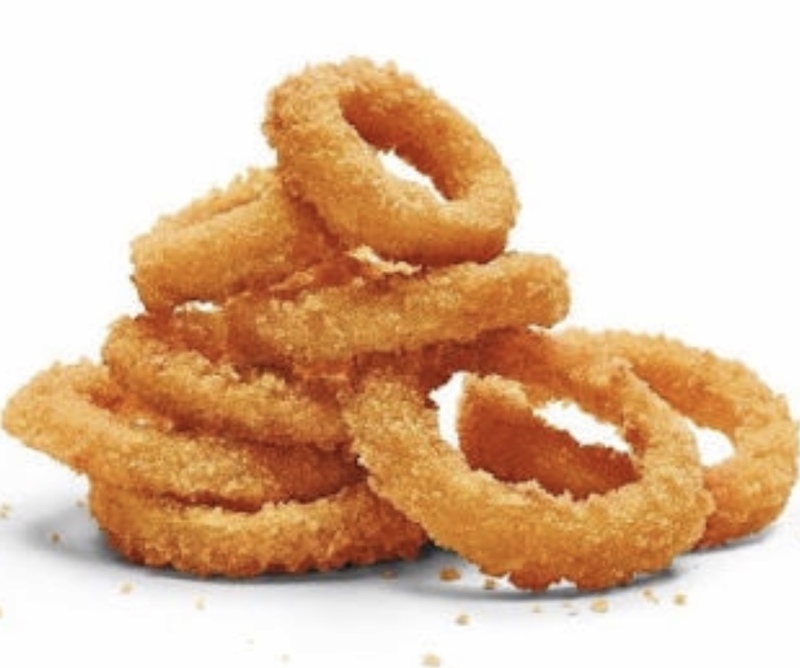 Served with curly fries and a few onion rings. 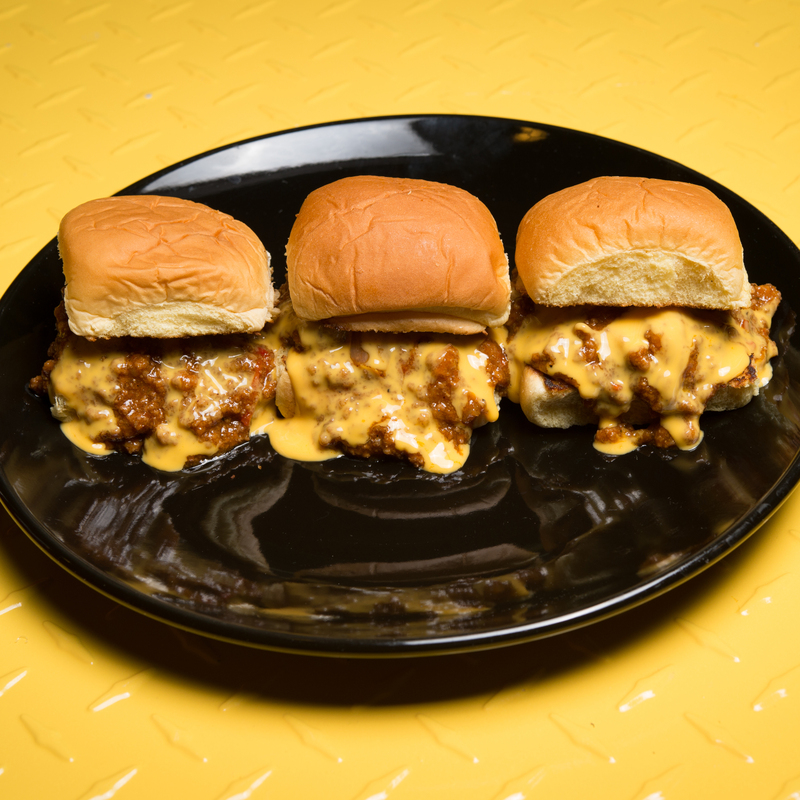 Our version of the sloppy Joe with a kick! 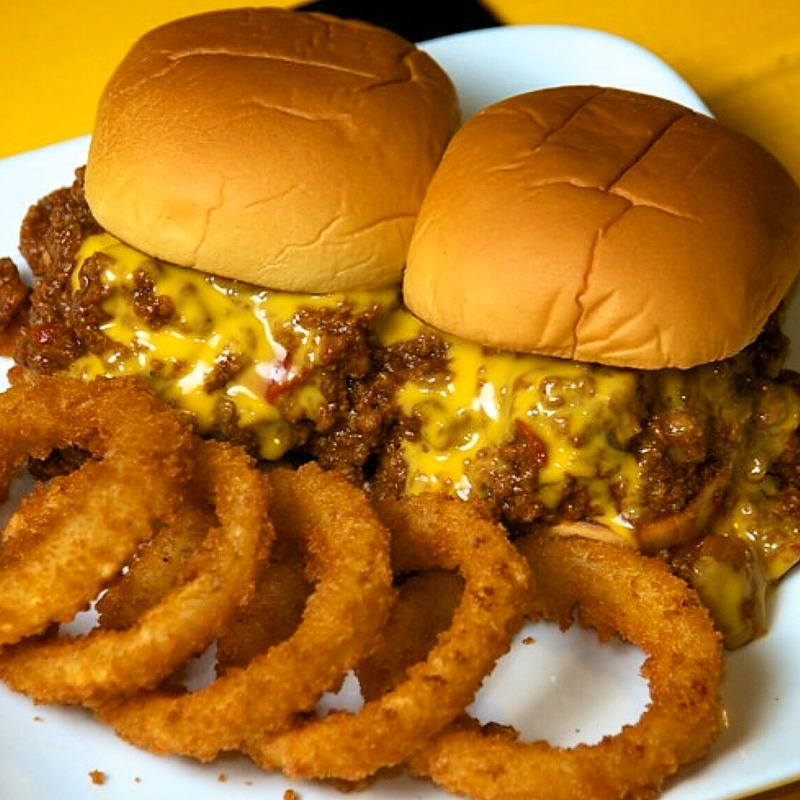 Ground sirloin beef mixed with sauteed red peppers, onions and flavored with our special blend of seasonings and spices. Served over-stuffed on a lightly toasted Martin's potato roll. 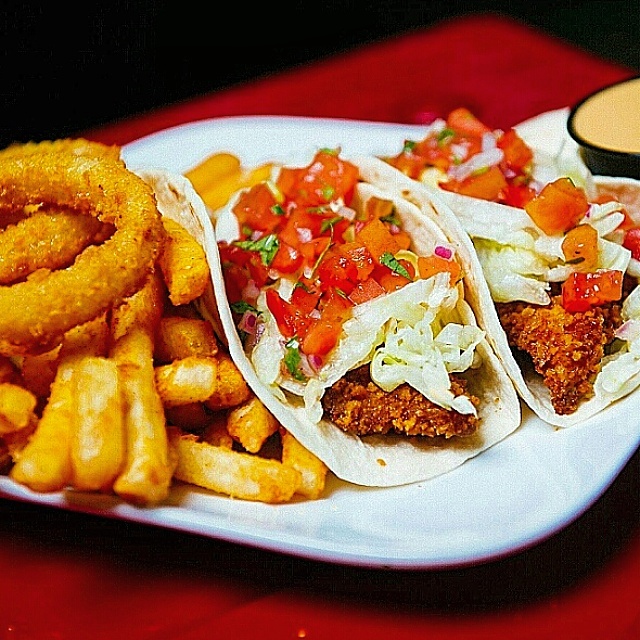 Our version of fish tacos: 2 warm flour tortillas stuffed with panko crusted "catch of the day," topped with shredded lettuce and our house relish, made with tomato, red onion and cilantro. Served with a creamy homemade tartar sauce or creamy chipotle dressing. 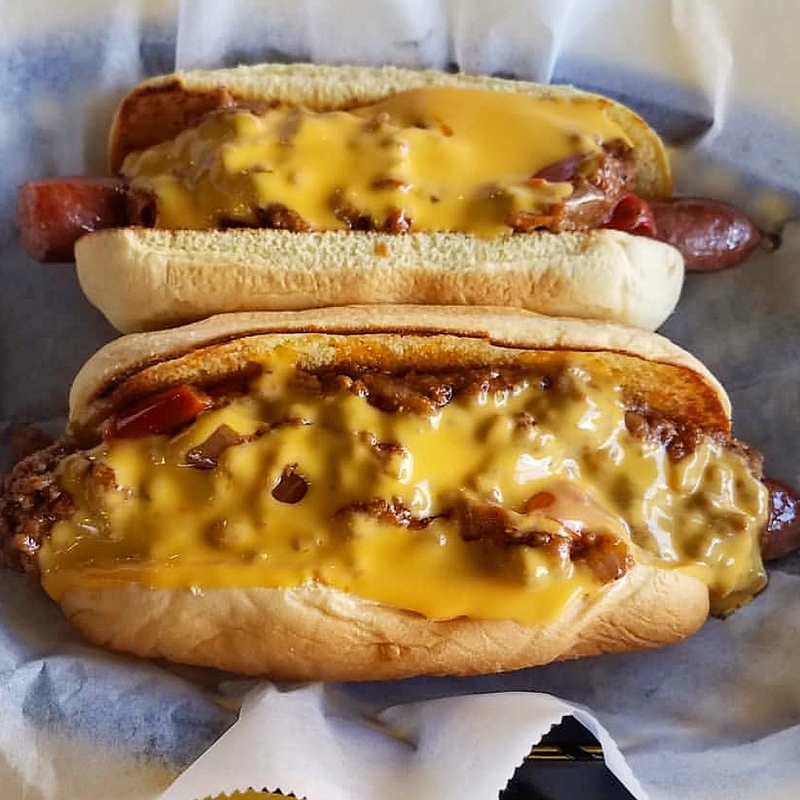 Special recipe all beef hotdog with a natural casing for that one of a kind snap, served on a Martin's potato roll, topped with our mojo (our version of sloppy Joe) and drizzled with cheddar cheese sauce. 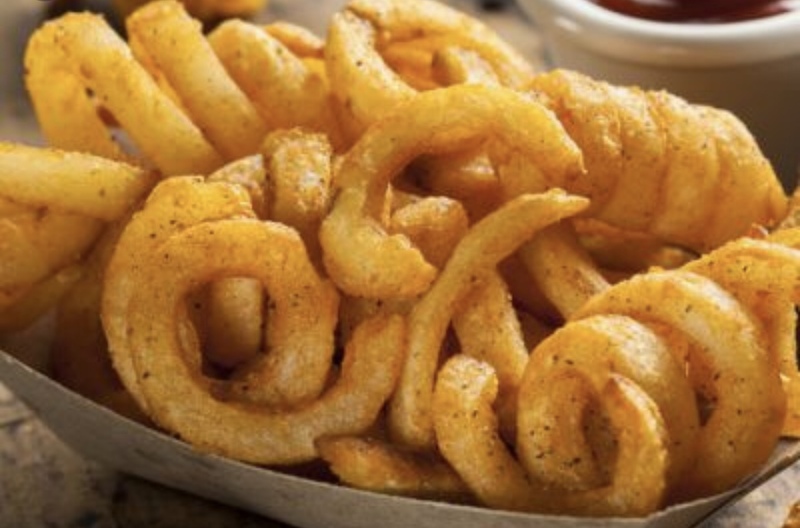 A child's portion served with extra crispy straight cut fries, choice of drink and a surprise treat. Burger grilled to order. 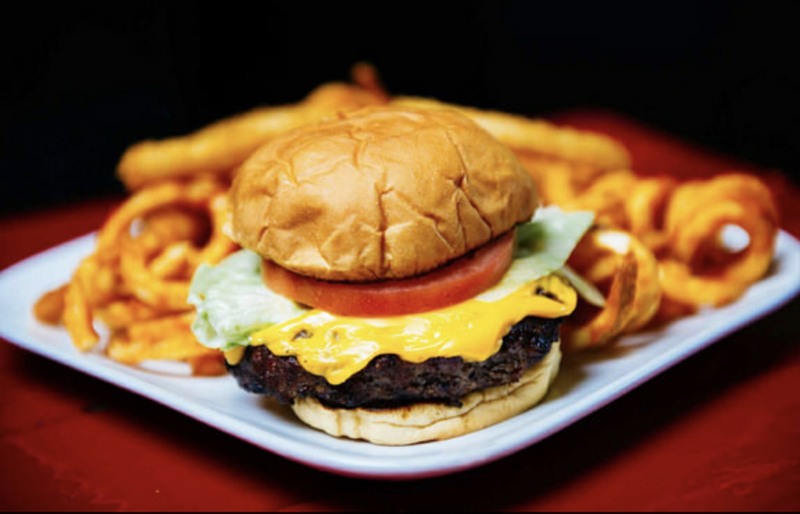 Served classically on brick oven bread or potato roll with lettuce, tomato and American cheese. 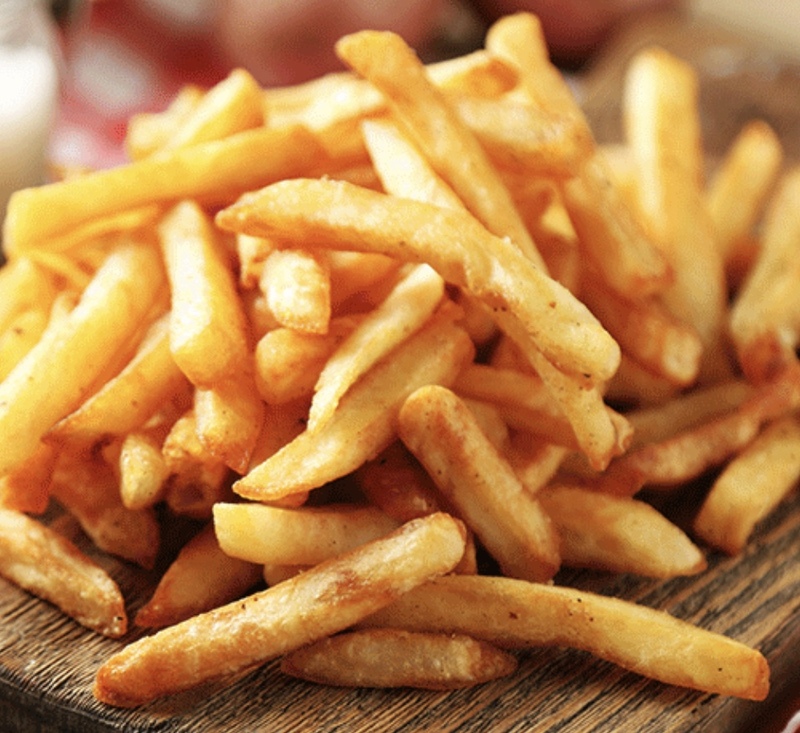 A child's portion served with extra crispy straight cut fries, choice of drink and a surprise treat. Juicy panko crusted chicken tenders. Served with homemade honey mustard sauce. A child's portion served with extra crispy straight cut fries, choice of drink and a surprise treat. 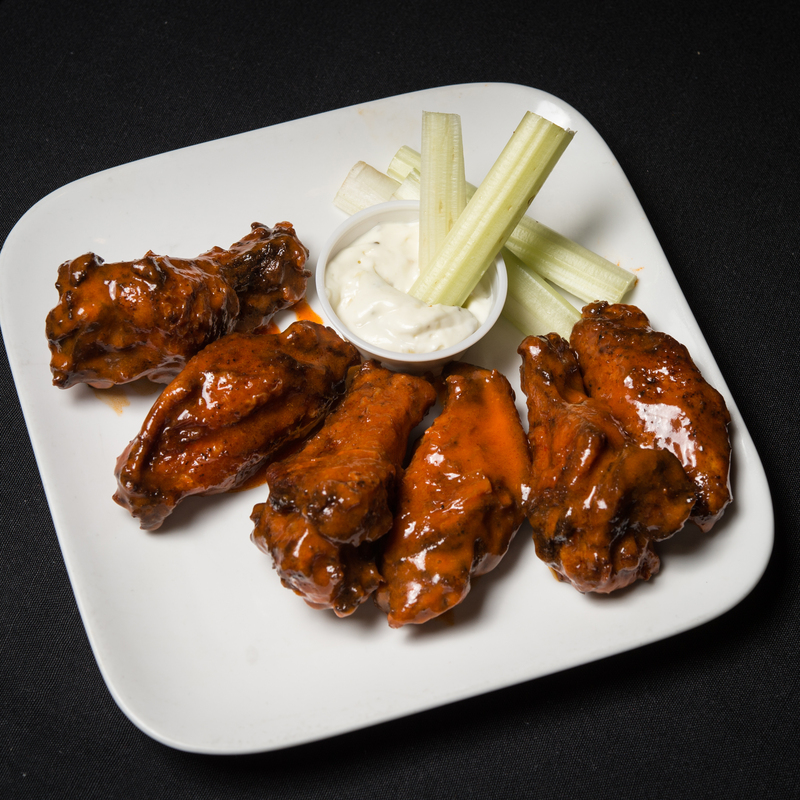 Your choice of chipotle style or Shanghai style wings served with blue cheese dressing and celery sticks. 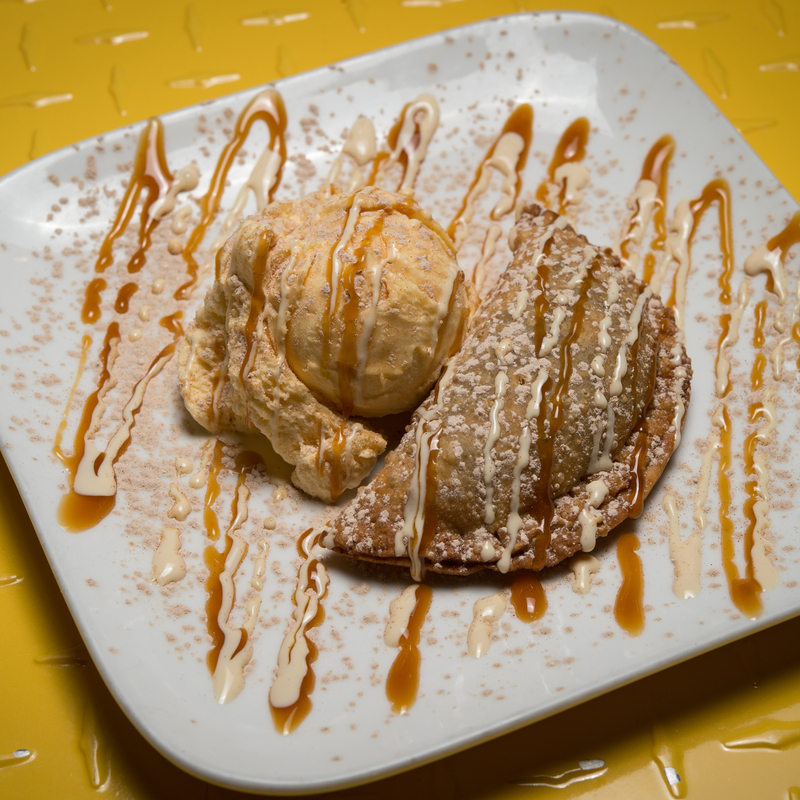 A warm and crispy homemade, apple pie prepared to order and topped with vanilla ice cream, sprinkled with cinnamon, powdered sugar and drizzled with vanilla and caramel syrups. 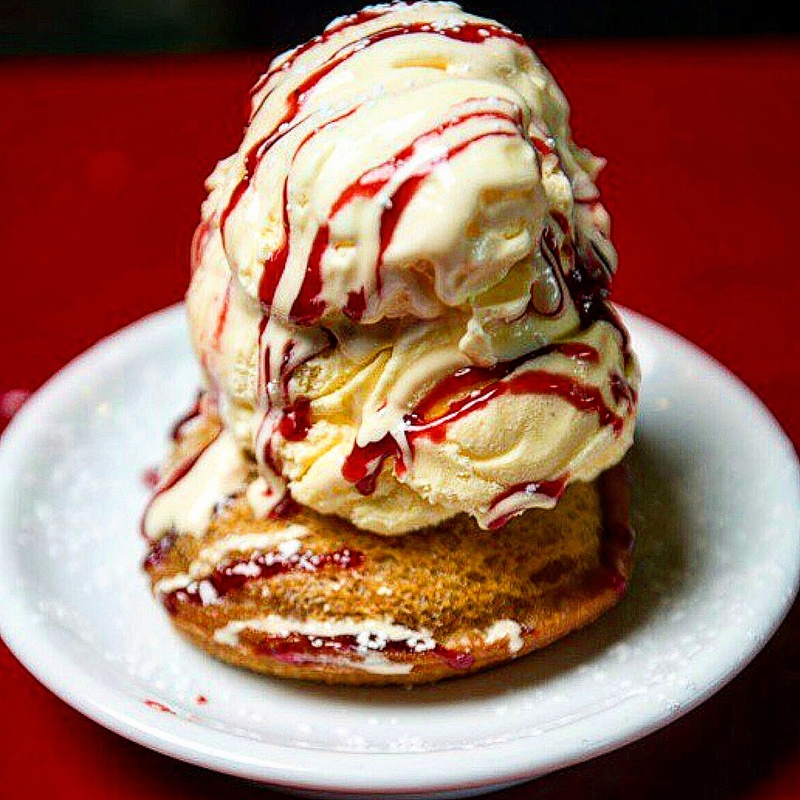 Modified peanut butter and jelly sandwich deep fried and topped with premium ice cream drizzled with vanilla syrup and grape jelly. Twinkies with a twist. 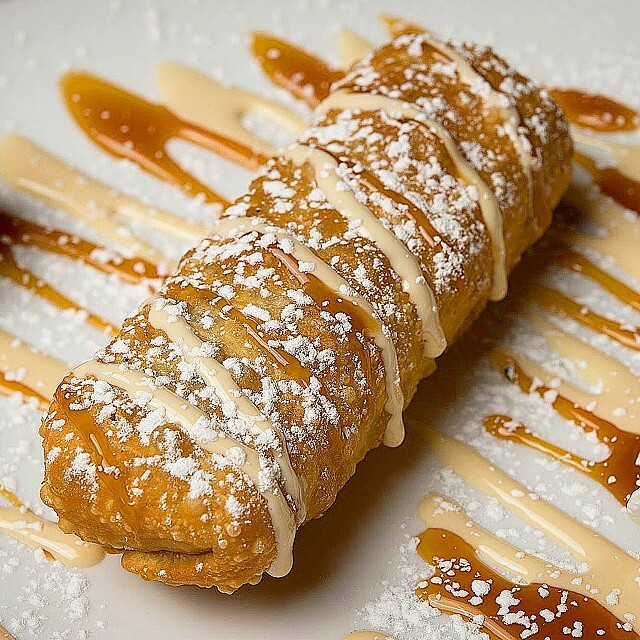 Deep fried in our signature batter for a crispy, golden treat sprinkled with powdered sugar, drizzled with vanilla and raspberry syrups. Choice of Snickers, Milkyway or Three Musketeers wrapped in our homemade dough and deep fried. Drizzled with caramel, vanilla and chocolate syrup. Fresh brewed espresso blended with premium vanilla ice cream, topped with whipped cream and cocoa powder. Made with premium ice cream. 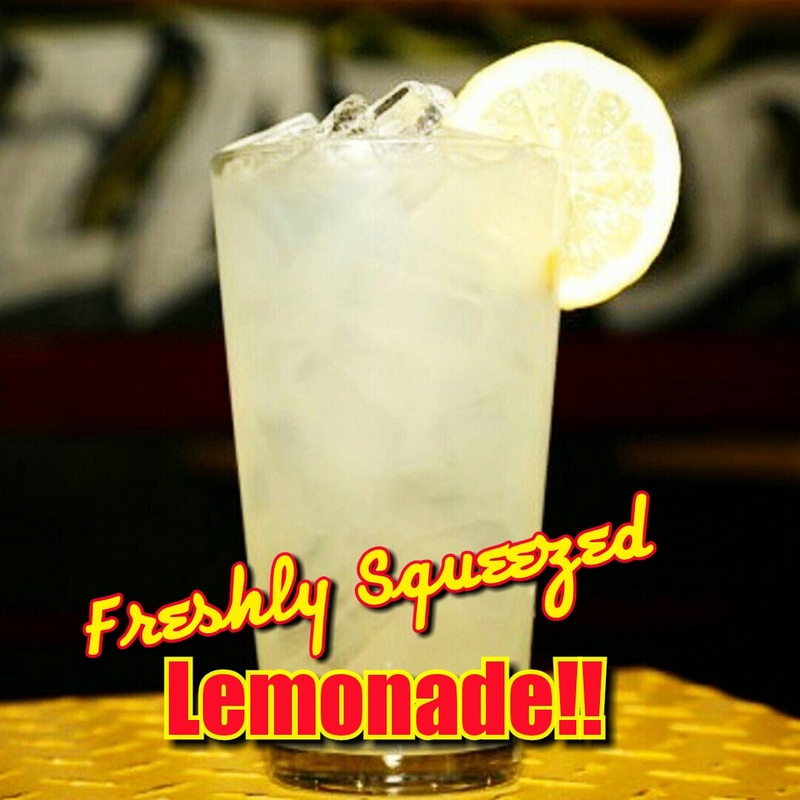 Fresh pressed, tangy lemons served over ice with a slice of lemon and lightly sweetened. 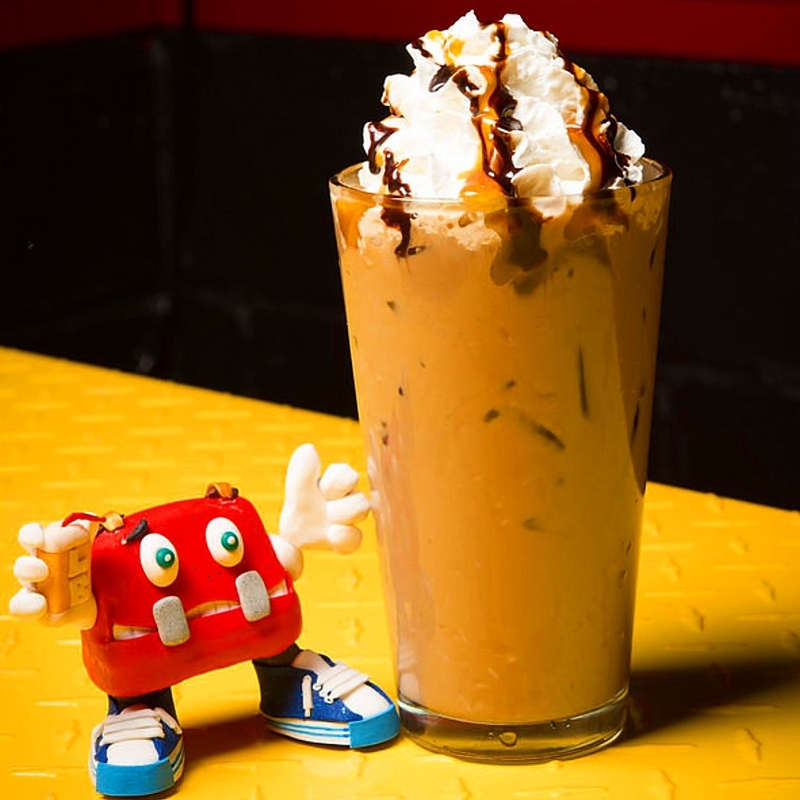 Espresso, milk and ice blended into a refreshing drink. Topped with whipped cream, drizzled with caramel and chocolate syrups. 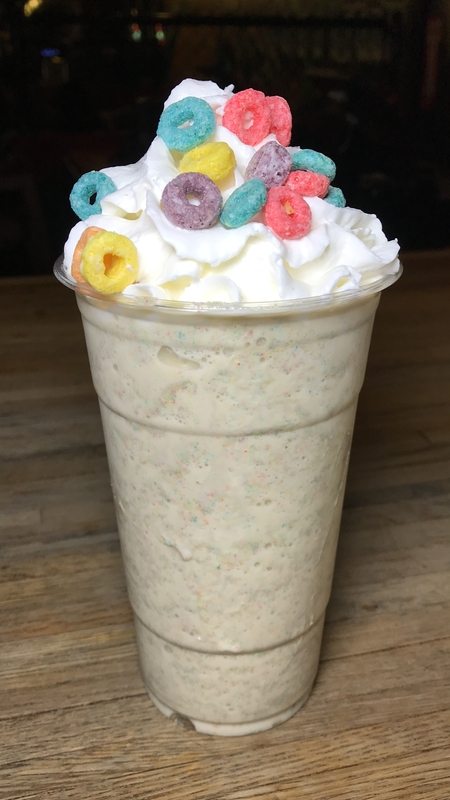 Choice of breakfast cereal, blended with premium vanilla ice cream, topped with whipped cream and sprinkled with crumbled cereal. Creamy peanut butter blended with premium ice cream. Mixed with grape jelly and topped with whipped cream and dressed with more grape jelly. Fresh brewed tea with a twist of our fresh squeezed lemonade chilled over ice. 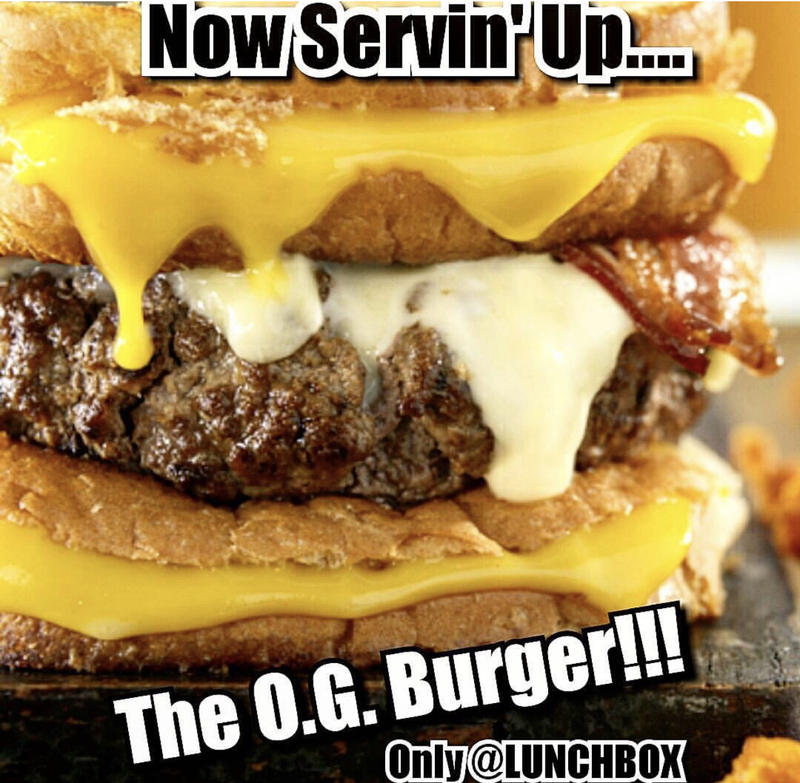 Juicy steak Burger stuffed between Double grilled cheese sandwiches topped with 5 strips of crispy Bacon & Caramelized onions melted provolone cheese & a side of our 50/50 sauce!! 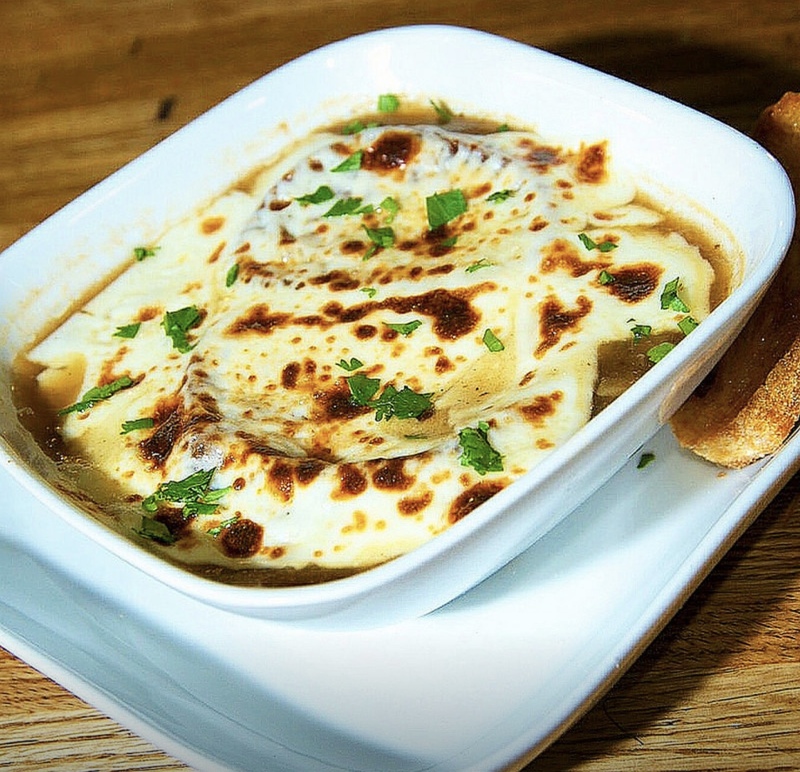 MELTED Monterey Jack Cheese served with a side of Our chipotle dressing!